John's is the best cheesesteak in the Philadelphia area and, thus, the planet. I've eaten at hundreds of places and never had a better one. Second place is the late, lamented Lubrano's in Pottstown, that shut down around 1990. 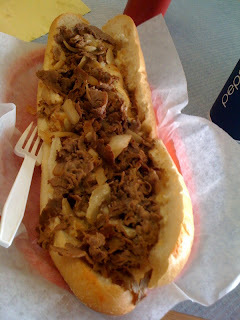 An overflowing cheesesteak in a dank strip mall location served up by a redhead with an accent. What could be better?